The team were thrilled to welcome Lancaster University Intern Gabrielle last week who popped by to discuss her new 12-week placement with our partner Mole Group Utilities as marketing specialist. Luckily the Green Mole team (including Sally dog) were able to steal her for a few hours. The intended introduction to the ambitions of the environmental division was flipped on its head as the English Literature Graduate and thespian Gabrielle demonstrated her creativity as she shared her own thoughts on how to promote sustainable energy generation at home and work. 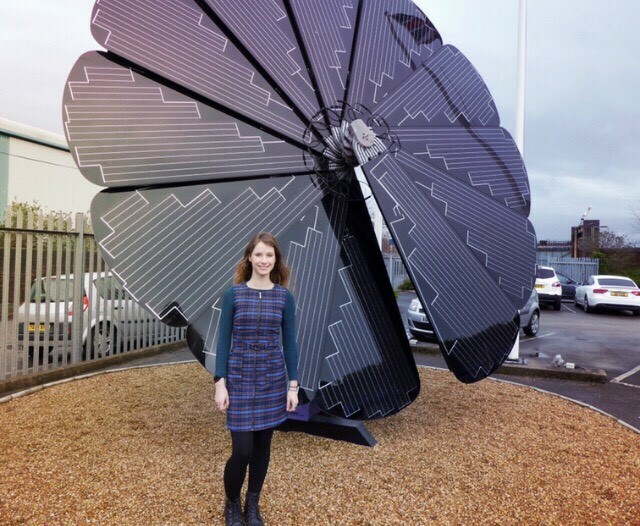 Just before the curtains closed on her first day with Mole Group Utilities, Gabrielle stopped by the SmartFlower to marvel at its all-in-one 2.5kW azimuth dual axis tracking capability to echo its beautiful simplicity up in her home county of sunny Cumbria.